Be whatever the season, the thought of chocolate itself makes us licking our lips in eagerness of the sweetest day of the year. World’s Chocolate Day – sometimes called International Chocolate Day is celebrated annually on July 7. As some chocolate lovers plan to celebrate Chocolate Week in style, we would like to share some interesting facts about chocolate. Chocolate is made from the fruit of cacao trees – a native to Central and South America. The fruits are called pods containing around 40 cacao beans, which are dried and roasted to create cocoa beans. In ancient times, chocolate was considered as the “food of the gods.” Historians have found that chocolate was produced by pre-Olmec cultures in 1900 B.C. The Mesoamericans who first cultivated cacao plants, fermented, roasted and grounded the cacao beans into a paste mixed with water, vanilla, honey, chili peppers and other spices to brew a frothy chocolate drink. Chocolate arrived in Florida on a Spanish ship in 1641. America opened its first chocolate house in Boston in 1682 and by 1773 cocoa beans were a major American colony import. Even though cocoa beans were discovered in America, about three quarters of the world’s cocoa is produced in Africa. The main cocoa-producing country was the Ivory Coast in 2016-2017, followed by Ghana and Indonesia. The Ivory Coast was also reported as one of the main cocoa bean processors in that year, second only to the Netherlands. In 1847, the British chocolate company J.S. Fry & Sons created the first solid edible chocolate bar from cocoa butter, cocoa powder and sugar. Family-owned companies such as Cadbury, Mars and Hershey led in a chocolate boom in the late 1800s and early 1900s. 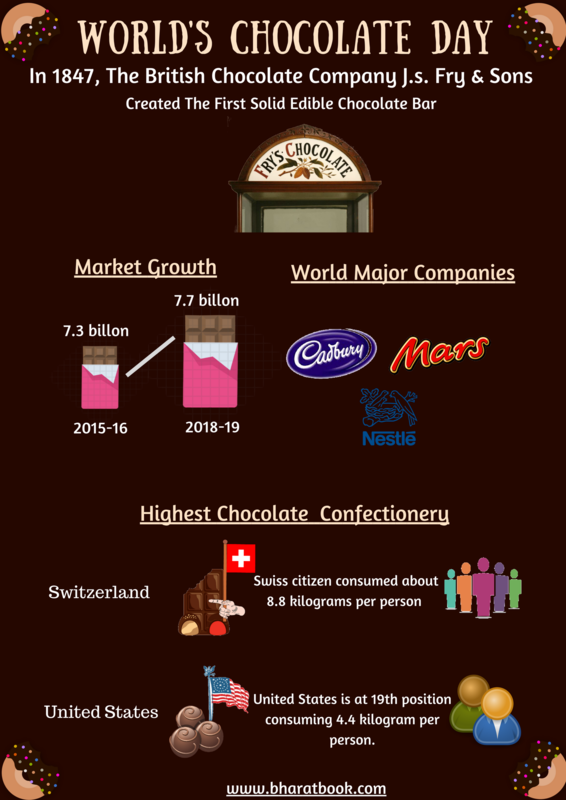 In 2015-2016, about 7.3 million tons of retail chocolate confectionery was consumed worldwide, with consumption expected to reach approximately 7.7 million tons by 2018/2019. Global retail sales reached 101 billion U.S. dollars in 2015, with the U.S. accounting for the largest portion of chocolate confectionary sales worldwide. According to industry experts, Switzerland had the highest chocolate confectionery consumption per person of any other country. On an average, a Swiss citizen consumed about 8.8 kilograms of chocolate in 2017, with the United States coming in at the nineteenth position at 4.4 kilograms per person. Chocolate can be described as unsweetened, bittersweet, semisweet or dark, milk, white and cocoa powder. It is also available to drink, but is more often enjoyed as an edible confection or in desserts and baked goods. Some scientists say that eating dark chocolate every day is better for you than eating vegetables. While your average chocolate bar isn’t considered healthy, dark chocolate has earned its place as a heart-healthy, antioxidant-rich treat. Chocolates have a special relationship with everyone. It has a delicious taste that no one can describe. It is a magic, when you look at it, hear about it, smell it and taste it. Chocolate not only appeals to the senses, it has a variety of beneficial ingredients that may do everything from lifting your mood to helping your heart. No wonder chocolate and Valentine’s Day go hand-in-hand. A food that is delicious, romantic and good for you too.